« Limoncello — Scripted Version! 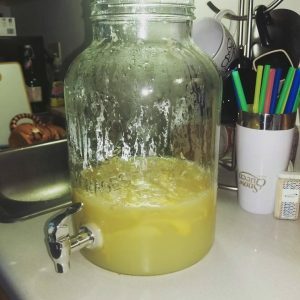 Since this was the first time I’d made the limoncello from scratch while documenting everything, it’s to be expected that there would be some changes. Also, I have a new beer making kit that I’ll be making use of down the line that should make my life easier. The instructions have been updated to reflect the new gear. 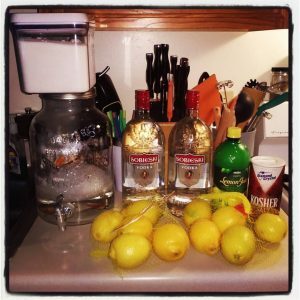 Anyhow, here’s the updated information on how to make my version of limoncello (with an addition for making my now-infamous blueberry limoncello). 1. Rinse lemons twice in hot water to remove any wax that may be on them. Once lemons are clear of wax, zest them using a potato peeler so that you have large strips. They will be removed prior to bottling, and this will make that easier. 2. In a large pot, combine 32 oz (1 bottle) of lemon juice, 4 cups of sugar, salt, and lemon peels. Toss the peels in cheesecloth to make them easier to remove later. Bring up to a simmer and allow sugar to dissolve. 3. While waiting for the sugar to dissolve, juice the fresh lemons. Add the fresh lemon juice to the container you’ll be using to make your limoncello. I’m using my beer kit’s fermentation bucket for this. It’ll later be transferred to a glass carboy to finish doing its thing. 4. Once cooled, add the sweetened juice mixture to the fresh juice and stir to combine. Peels go in, too! 5. Add your vodka, stir to combine again, and put in the corner for the next month. 6. 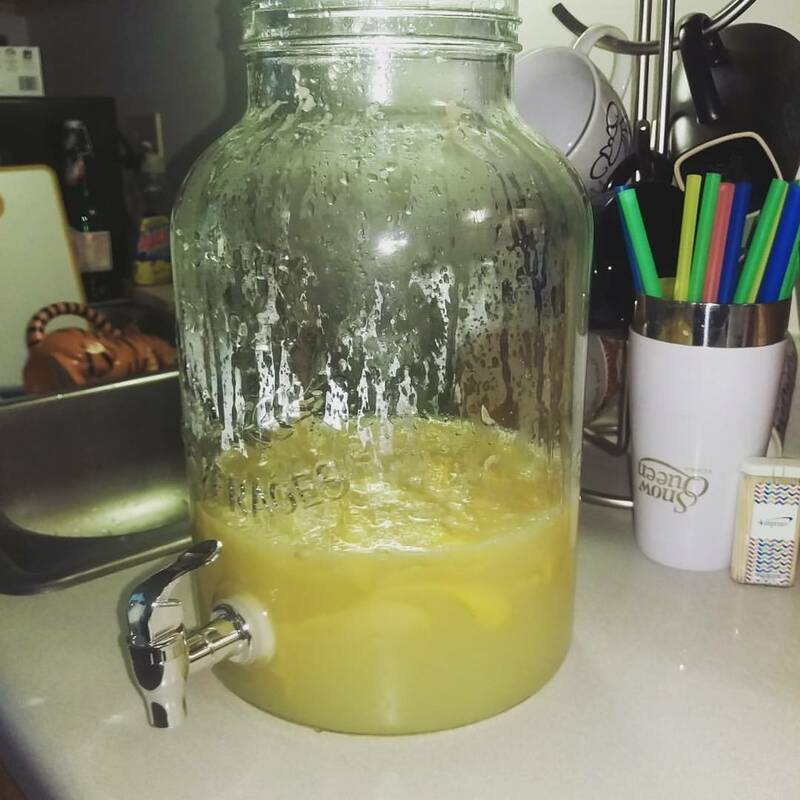 After a month has passed, heat the rest of your lemon juice (64 oz. – 2 bottles) and sugar (8 cups) together and combine to make a lemon simple syrup. Remove bundle of lemon peels from base and discard. While the lemon simple syrup is heating up and the sugar is dissolving, transfer the base to a glass container (I’m using a 3 gal. carboy now). Once the sugar’s dissolved, add the simple syrup and combine. 7. After another months, bottle and enjoy your regular limoncello. If you want plain limoncello, stop here. If you want blueberry, proceed to the next step! 8 (Optional). 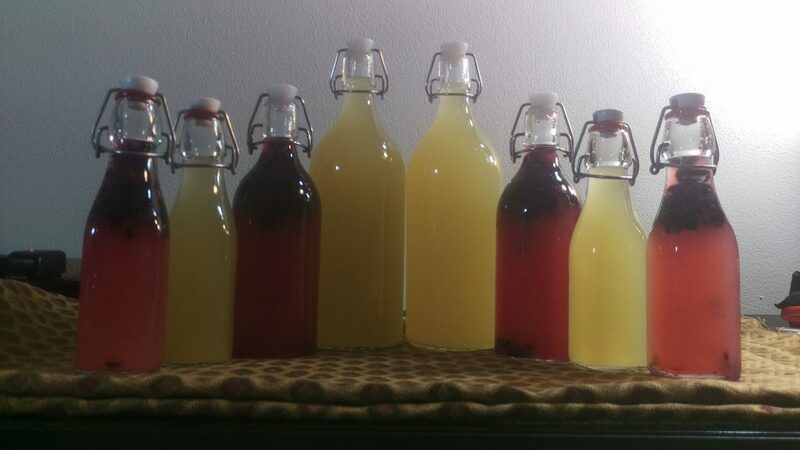 I usually split my batches of limoncello into regular and blueberry. Start with a pint of blueberries. Roll them in sugar and add to your bottle. I usually add enough blueberries to fill 1/6 to 1/4 of the bottle. 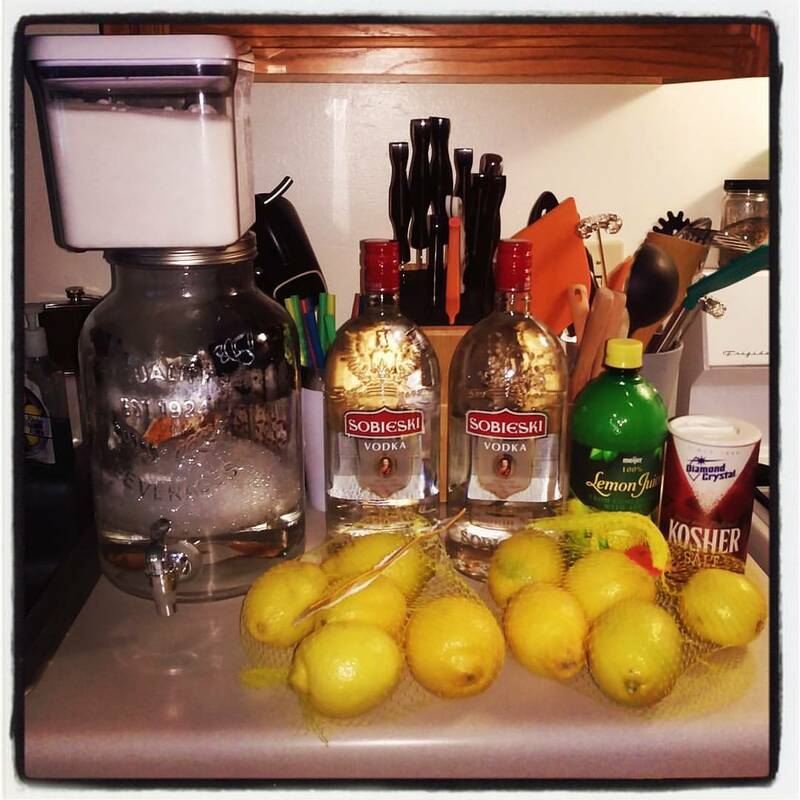 Top off with limoncello, shake to dissolve the new sugar, and let sit for 2 more weeks. After 2 weeks, it’s ready to drink, but it only gets better as it ages. 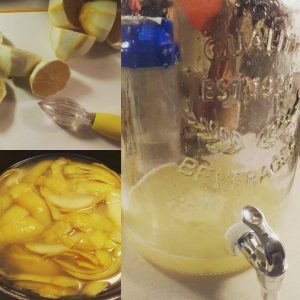 Tagged cooking, limoncello, recipe. Bookmark the permalink.